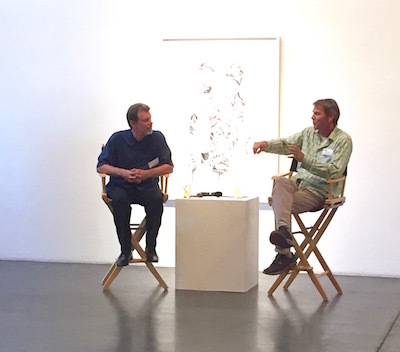 Institute of the Arts and Sciences Director John Weber, left, and artist Russell Crotty during a June 2015 Original Thinkers talk. You no longer have to enroll at UC Santa Cruz to hear from some of its leading voices in prison reform, genetics, gaming, and ocean ecosystems. 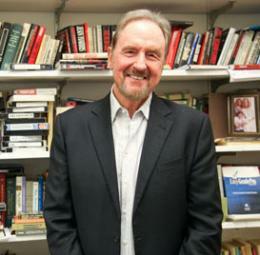 Professor Craig Haney, who has spent his career probing the psychology of imprisonment and the causes of violent crime, will deliver the next talk on Wednesday in San Jose. It is titled "Are We Bending Toward Justice? The Urgency (and Possibility) of Criminal Justice Reform." Haney will deliver the same talk next month in Los Angeles. Groundbreaking genomics researchers from UC Santa Cruz will be featured at a May 24 event in Palo Alto. Professor Raphael Kudela and Assistant Professor Kristy Kroeker together talked about the drought, the warm water blob in the ocean, and toxic algae in February in Watsonville. "My research is really motivated by a desire to support healthy ecosystems and local communities in our coastal zones," Kroeker said. "Having our own community understand how the ocean is changing and engaged in conversations about the challenges is really critical for developing sustainability." Kroeker said the event was a great opportunity to engage with folks in the community to learn more about their concerns and questions. Last fall, Professor Robin Hunicke and UCSC alum Akira Thompson talked about new directions in design and games in San Francisco. Hunicke is the director of the new Art, Games & Playable Media BA program at UC Santa Cruz. A game designer and producer by training, she has a background in computer science, fine art and applied game studies. Thompson is owner and Game Designer of RainBros which recently released the IndieCade award nominated art game "...&maybetheywontkillyou" a live action role playing game about being poor and Black in America.